It's now 3:14 p.m. in the Midwest, and sometime within the past two or three minutes, The Online Photographer logged its 4,000,000th visitor. Whoever it was has just won a NEW CAR! 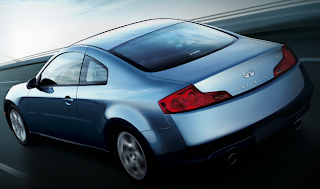 That's right, a brand new blue Infiniti G35 Coupe. Oh, no, wait, that's for the 40 millionth visitor. Never mind. We'll hold you to it. Keep up the good work. Thanks for sharing your articles with us, now thats a real lux's. Cheers Mike! BTW, you're doing a stupendous job with your site. Congrats! Wow that's great!!! The next $ million will come much faster. A Great and Enjoyable site. Many thanks for all your hard work. Congrats on reaching 4 million - an amazing milestone! Keep up the good work. do a review of the R Module, and the Leica external viewfinder for the M8 and you will hit 40 million hits in a jiffy. Nothing like 3 Million foaming, LEICA Jihadists to drive up the numbers! All kidding aside Mike, I still check out TOP first every morning. PS I look better in black cars anyway. Errr Mike,do you think some of them just couldn't spell The Online P*r*ographer? i almost took the window for a popup, they are always saying that I'm the 1 millionth (or 4 in this case) visitor, and insist that i have one something :D at least here it doesn't link to a virus. Good work Mike, your Blog is a joy to read! Way to go, bud. Please make mine stick shift. My hits have to total at least 500,000 of those 4,000,000...does that qualify me at least for a hubcap? Well, never mind..a friend of mine here in Costa Rica happened to be the nth person to buy gas with a certain credit card and won a car for her trouble. A lime green VW bug..too cute for words..it turned out to be the biggest headache of her life...couldn't sell it, everybody knew she won it and wanted to pay about half the value, couldn't keep it due to exorbitant road taxes..now, if it was an M-8 up for grabs, well then, that would keep me clicking my Bic pretty much non-stop ;)) Muchos congratulations, Mike!!! You've earned it, big time, Mike! Don't remember how I discovered your site, but since then I've been a super-avid visitor. Congratulations. How long did it take to log your 4 millionth visitor? "How long did it take to log your 4 millionth visitor?" One year, five months, and two days. Congratulations. 4 million satisfied readers - who else can actually make such a claim?